HomeGold IRA BlogBitcoinBitcoin 101: Should You Invest? Boiling down the question “what is bitcoin?” goes something like this – Bitcoin is simply a peer-to-peer digital payment system that bypasses traditional intermediaries – like banks or exchanges. It then uses encryption power to protect the individual “currency” transfers. Payments are sent instantly and are facilitated via a decentralized network of companies and individuals called “miners.” Simply put, Bitcoin is a virtual currency (often referred to as “cryptocurrency”) sent from one person to another. Nothing tangible, nothing to lock up in a safe, and nothing beyond a transaction completed using blockchain technology to facilitate the movement of money. So let’s get right to it and answer some basic questions related to Bitcoin investing to help you determine whether it is right for you. How is it regulated? Since there is no real governing authority involved in these transfers, Bitcoin is still a bit of an anomaly to many traders. Part of that is because there is no centralized trading group involved in the process of overseeing Bitcoin transactions. No government or centralized agency officially backs Bitcoin, and that has many people looking at Bitcoin as a sort of monopoly money for the 21st century. The lack of regulation does impart a bit of risk if you’re looking at Bitcoin as a potential investment opportunity. How is the value of one Bitcoin determined? Since there is little to no regulation of Bitcoin, its value tends to be a bit of a rollercoaster ride for investors. Here’s the thing to keep in mind when determining the price of one Bitcoin: it has no real value… but neither does the US dollar! In actuality, both are only valuable because of the inherent demand of a scarce, tradeable, and fungible currency. So, the value is determined by the perception of its future worth. What prevents it from losing value? Unlike other investments that are based on something tangible – like gold, silver, real estate or commodities, Bitcoin isn’t backed by anything of any real value. So while Bitcoin’s value has increased quite a bit over the past year or two, investors tend to experience wild value fluctuations in a short period of time. For example, the value of one Bitcoin ranged anywhere from $2,000 to $3,000 over the course of a 4-week period in late 2017! Is Bitcoin a risky investment? Any investment carries some element of risk – some more than others, of course – but here’s the potential concern with Bitcoin. First, it has little to no track record. Bitcoin has been around for less than 10 years, and only really began to show its legs in 2011 and beyond. Compared to traditional investments, Bitcoin is still in its infancy, and this developmental phase in the currency’s lifespan makes it a high-risk, high-return option today. 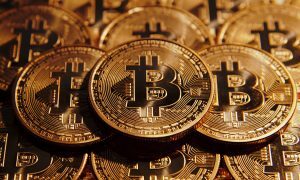 Another concern is that Bitcoin, being essentially unregulated, may be used for illicit or black market transactions – and that may invite serious governmental intervention in the near future. While the FDIC insures deposit accounts and the SIPC covers some investments, the Bitcoin exchanges are not (yet) insured by any type of government program. What are the tax ramifications of investing in Bitcoin? Here’s what might be the real drawback to investing in Bitcoin – the currency is ineligible to be included as part of any retirement account that offers tax advantages, like you’d find with a 401(k) or IRA. Bitcoin is also considered as property for taxation purposes, according to the IRS, and that could lead to less favorable tax implications when included as part of your investment portfolio. It pays to sit down and speak with an investment advisor if you’re considering including Bitcoin as part of your retirement plan. Bitcoin is truly in its infancy as a globally-recognized currency, and that means that there might be some serious gains to be made if you’re willing to hang on tight and buckle up for a wild ride. The cryptocurrency world is for the brave, but the majority of investors seem perfectly happy to be sitting on the sidelines, watching this investment vehicle grow, develop and create its own legacy. If you are ready to invest in Bitcoin, do so slowly to minimize your exposure. And as always, balance your portfolio with an emphasis towards long-term growth and overall portfolio stability. For more information on investment options, including gold IRAs and other precious metals opportunities, contact American Bullion today!